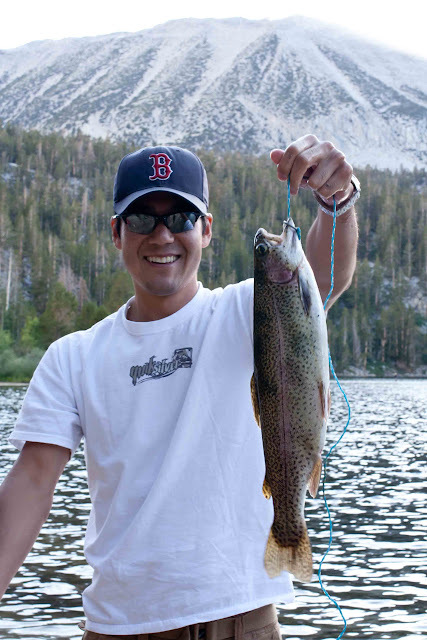 You may have caught our fishing trip to the Eastern Sierra earlier this week--the one where my son Rick caught the big trout. Rick immediately thought of Jichan, his grandfather, and how much he thought Jichan would enjoy eating this fish. We didn't camp this time, we stayed in a hotel in Bishop. They've got a Fish Cleaning Room there--sink, disposal, scale and freezer to store your fish until you leave. Yesterday I grilled the fish. 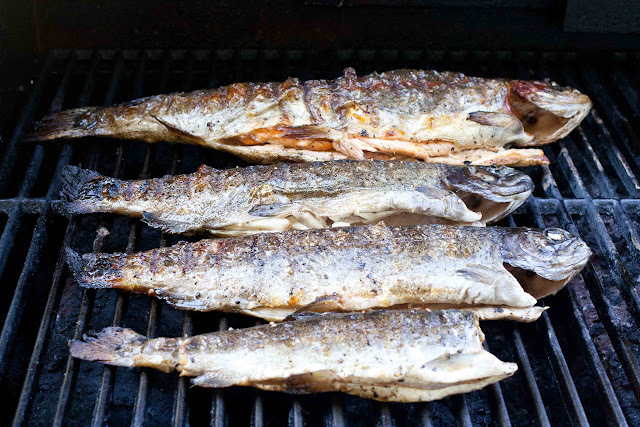 Sometimes simple is best, so I used salt and pepper to give them a little seasoning and put the fish on the barbecue. I used the low setting and grilled them until the meat in the cavity was cooked, then flipped them over, about 4 minutes on each side. I had some photos of preparing and cooking the fish, but somehow the memory card in my camera got damaged and I lost all the photos. I only have these few, but the preparation is simple, just salt and pepper. Before starting to cook the fish and after cleaning the grill, put some cooking spray or oil on the grill so the fish won't stick. Since Rick wanted Jichan--and Bachan too--to eat the fish, I put it on a platter with some greens, lime wedges, a few clusters of mini tomatoes and gave them a call. "Would you like some barbecued trout for dinner? I'll bring it over." My mother-in-law's voice lit up, "Really? I can come over." My mother-in-law is 88 years old. I would prefer to deliver it to her, but she wanted to come and get it herself since I was doing her such a favor by cooking the fish and giving it to her--she thought the least she could do is come over and get it. She only has to drive one mile...but still. When she came over and saw the big fish on the platter, she was so appreciative. 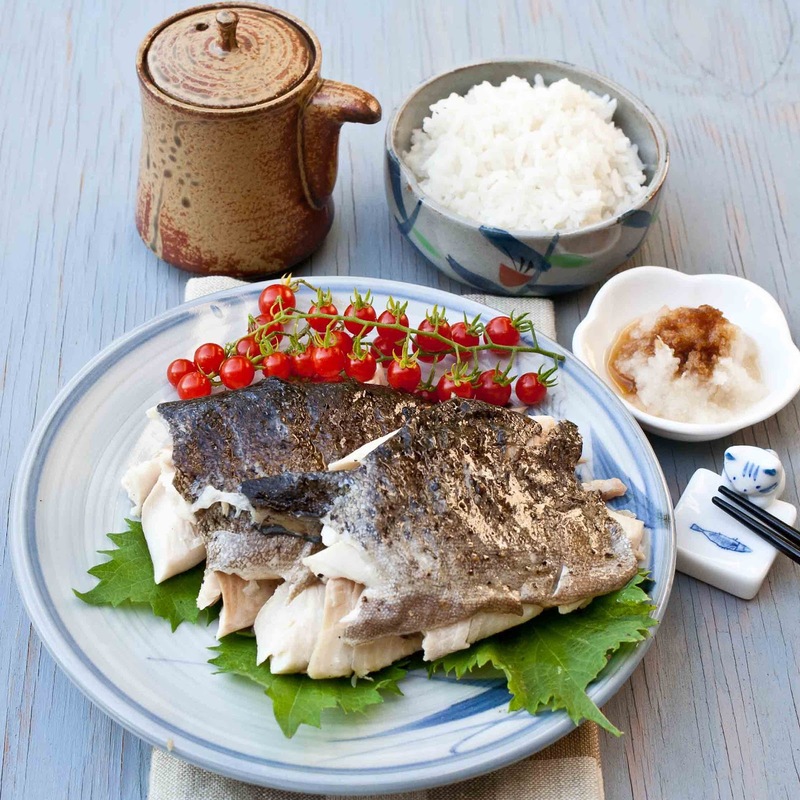 This is the kind of Japanese meal my grandparents used to eat--fish, rice and fresh vegetables. That's a big portion, they would eat half the amount of fish, and maybe add some sliced cucumbers or some tsukemomo. This is a picture of my mom on her wedding day with my two grandmothers. A long time ago my mother told me something that her mother told her. Be nice to your husband's parents, give them your attention. They're older than we are. You'll be happy you did. It's something I've always remembered and try to live by. It hasn't always been easy, but now I feel like my mother-in-law is one of my biggest fans. She doesn't like to cook and really appreciates that I do--and I bring her food. She thinks that it was me that left a puppy in her yard for her to find and care for--but it wasn't me (really, it wasn't me!). She likes that I come and help her with the difficult 2000 piece jigsaw puzzle she's been working on all year. It's a secret that I have to remove the pieces that she pounds in to fit--and the pieces I remove are more than the pieces I place to complete the puzzle. It's getting to completion though, little by little, the sky is all done now and the two areas on the right and left are slowly but surely closing. 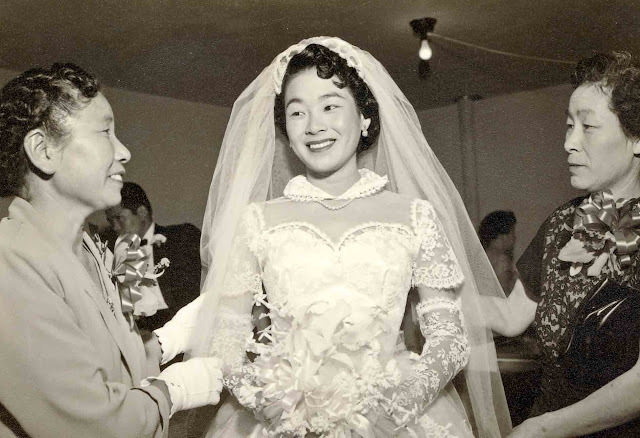 When the times have been tough between my mother-in-law and I, I've thought about what my mother told me, and added a question of my own that I ask myself in difficult family times. "What's more important--having a close family, or your own ego?" Sometimes that answer isn't always clear, but it helps. Great wisdom Karolyn. A good reminder for me. Well, your mom-in-law is way better at puzzles than me. I don't think I'm even that far. 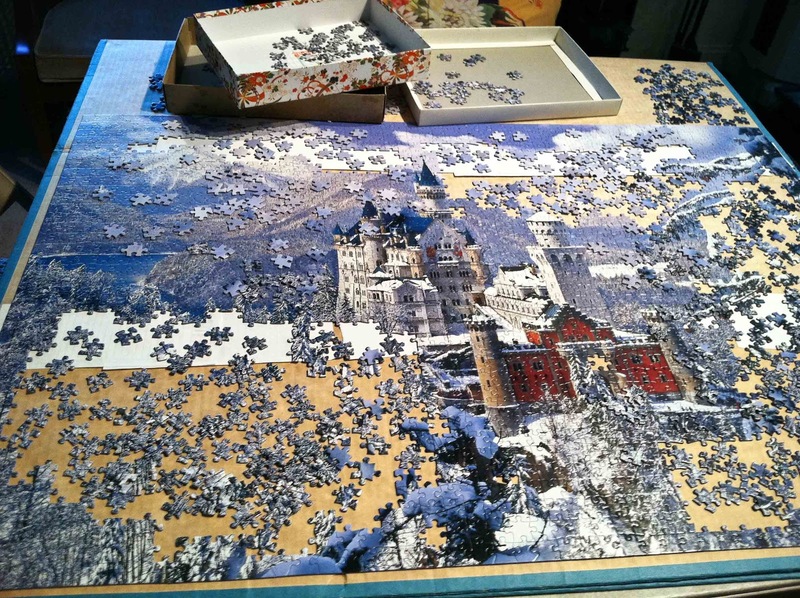 Hmmmmmmm, think you might have a little evil streak in you, Karolyn - torturing us with really, really hard puzzles. Fish looks delicious. 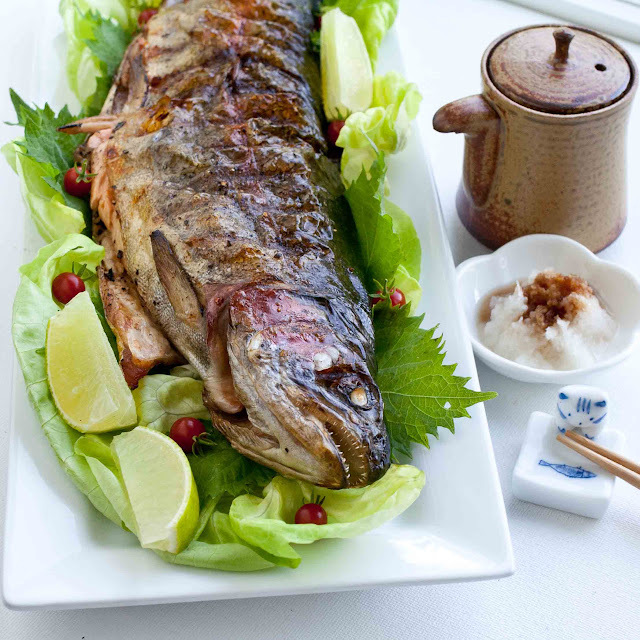 My mom use to fry the fish until the skin got really crispy - yummy with rice and a little soy sauce. That's a nice way to ignite everyone's appetite for a large trout like that.